In 1886 the pitcher’s box was made a foot deeper and the rule requiring the pitcher to keep both feet on the ground when delivering a pitch was lifted, prompting an increase in strikeouts in both the American Association and the National League. Nowhere did this change have more impact than in Baltimore, where Matt “Matches” Kilroy, a rookie pitcher for the American Association Orioles, set a record for strikeouts in a season with 513. 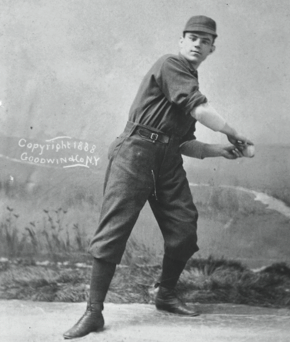 On October 3, in a game against Louisville, Kilroy surpassed the previous strikeout record of 483, set in 1884 by Hugh “One Arm” Daily. Kilroy was a Philadelphia native who began his professional baseball career with the Augusta Browns in 1884. The following year he led the Browns into contention in the Southern League. That fall he signed with the Orioles. The left-hander’s signature pitch was a knee-buckling curve that was practically unhittable for left-handed batters. Kilroy put together a great rookie season. He had won 28 games and struck out 472 batters by the time the Orioles reached Louisville in late September. Both the Colonels and Orioles had played themselves out of contention for the American Association pennant. Baltimore had performed poorly all year and finished 35 games under .500. Louisville ended the season 25½ games out of first place. The Orioles won the first game of the series at Eclipse Park. In the second game Kilroy squared off against Louisville ace Toad Ramsey. 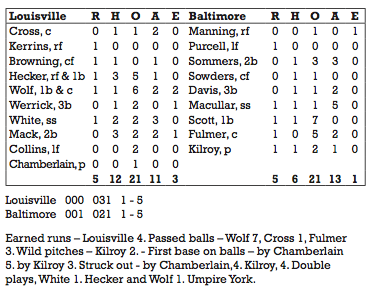 The Colonels got to Kilroy early and ended up beating Baltimore 7–3. Ramsey, who finished second to Kilroy in strikeouts that season with 499, fanned 11 Orioles, including nine in a row. Kilroy struck out nine Louisville batters in the loss, putting his total for the season at 481. On the next day, a Sunday, the teams played in front of 1,000 wind-chilled fans. In an era where pitching on consecutive days was commonplace, Kilroy was back in the box for Baltimore. From the outset, the Louisville players and spectators complained to umpire Tom York that Kilroy was not releasing the ball from the designated pitching area. Frustrated over York’s failure to censure Kilroy, Colonels manager Jim Hart instructed his rookie hurler, Elton Chamberlain, to retaliate by running out of the box while delivering his pitches. According to the Louisville Courier Journal, “This scared the Baltimore batters out of their wits” and Kilroy refrained from any more questionable pitching tactics for the remainder of the game. Louisville’s starting catcher, Amos Cross, split his finger severely in the fourth inning and had to be removed from the game. His replacement, Jimmy Wolf, had a tough day, allowing seven passed balls while committing two costly throwing errors. Baltimore scored first, a run in the third inning. The Colonels, who chose to bat first that day, scored three runs in the fifth with hits from Pete Browning, Guy Hecker, Jimmy Wolf, and Joe Werrick. In the Baltimore half of the fifth, with a man on base, Kilroy hit a fly into shallow center field that dropped in for a hit. A throwing error on the play allowed both men to come home. In the next two innings, each team scored twice more. With darkness approaching, the game was called at the end of the seventh inning with the scored tied, 5-5. Throughout the contest, Louisville had had a number of chances to take the lead, but failed to do so for lack of timely hitting. (Also, Hecker and Wolf were picked off base by Kilroy.) Defensively, Louisville left fielder Hub Collins made the best catch of the afternoon, robbing Orioles right fielder Jack Manning of extra bases in the third inning. Bill White and Reddy Mack also contributed good plays in the field for the Colonels. Jimmy Macullar, Joe Sommer, and Jumbo Davis did the best glove work for Baltimore. Starting the game with 481 strikeouts, Kilroy passed Daily’s mark of 483 with the third of four batters he fanned that day. The durable southpaw pitched four more regular-season games for Baltimore that year, including a no-hitter against Pittsburgh three days later. He finished the 1886 season with 29 wins, 66 complete games, and five shutouts. The next season Kilroy won 46 games, the record for wins by a left-handed pitcher. But his meteoric rise was followed by an equally rapid fall. In an age where managers gave little thought to overworking their pitchers, Kilroy was a prime example of the negative effects of this practice. During his first four major-league campaigns, he pitched 1,974 innings, with 222 complete games. These figures do not take into account the numerous exhibition games he pitched before, during, and after the season. In the years that followed, Matches’ arm was worn down from overwork and he was never the same pitcher. The level of greatness Kilroy achieved early in his career eluded him for the rest of his days on the diamond.